We proposed a novel framework for video content understanding that uses rules constructed from knowledge bases and multimedia ontologies. Our framework consists of an expert system that uses a rule-based engine, domain knowledge, visual detectors (for objects and scenes), and metadata (text from automatic speech recognition, related text, etc.). We introduce the idea of modal keywords, which are keywords that represent perceptual concepts in the following categories: visual (e.g., sky), aural (e.g., scream), olfactory (e.g., vanilla), tactile (e.g., feather), and taste (e.g., candy). A method is presented to automatically classify keywords from speech recognition, queries, or related text into these categories using WordNet and TGM I. For video understanding, the following operations are performed automatically: scene cut detection, automatic speech recognition, feature extraction, and visual detection (e.g., sky, face, indoor). These operation results are used in our system by a rule-based engine that uses context information (e.g., text from speech) to enhance visual detection results. 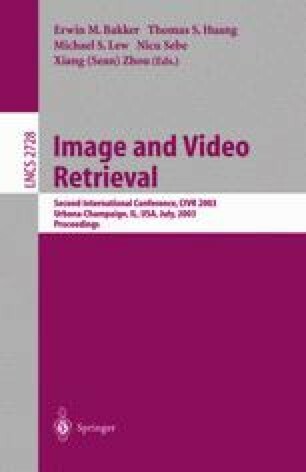 We discuss semi-automatic construction of multimedia ontologies and present experiments in which visual detector outputs are modified by simple rules that use context information available with the video.